If making your own healthy drink from cactus fruits that you harvest yourself sounds intriguing, but the spines put you off, we have a solution for you. This simple method doesn’t involve burning off every spine, cutting or scraping off each spine cluster, or even wearing thick, spine-proof gloves. You can put away your matches, knives, scrapers, and gloves. All you need is water. dot the surface of prickly pear cactus fruits. This easy and effective method to remove the tiny, hair-like irritating spines (called glochids) from prickly pear cactus fruit is a family secret we’ve decided to share with everyone. My family also developed a method to extract the pure juice that is so easy, you’ll have to try it to believe how simple and tidy it is. We have such fun making this specialty beverage at our home, we think you, too, will enjoy the amazing ease of creating this healthy, “wild” drink. Of course, there is another option: you can buy prickly pear cactus fruits, called cactus apples, cactus pears, or “tunas” in Spanish, from your specialty grocery store or farmer’s market, and the spines will have already been removed. However, you can expect to pay about 99 cents per fruit, a hefty price compared to what you find for free if you just cruise down any southwest neighborhood and discover yards with thousands of cactus apples on prickly pear cactus going mostly unappreciated and unused. 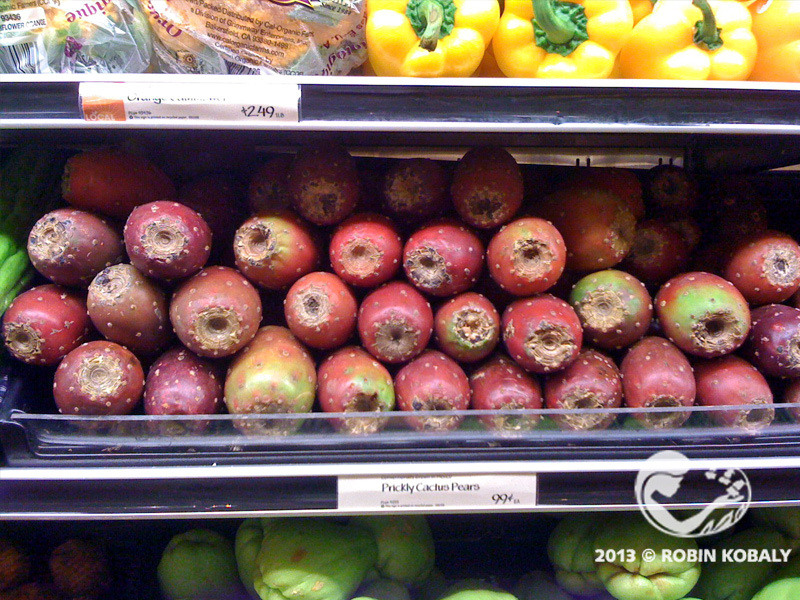 “Prickly Cactus Pears” for sale in a grocery store for 99 cents each –tiny spines already removed. In the southwest US, fruits of the native Engelmann prickly pear (Opuntia engelmannii) are often used by residents and by commercial producers of prickly pear syrup and candies, and unsweetened juice. Across the rest of America and around the world, fruits of the prickly pear native to Mexico, Opuntia ficus indica, are the most harvested, as that cactus has been taken from the Americas and spread all over the planet starting with Columbus. Here’s your key to harvesting, processing, and extracting pure “Ruby Nectar” cactus juice with no risk of spines in your fingers and minimal clean-up from start to finish. You will never need to touch the fruit with your hands during the entire process, and all the tiny glochids will just float away, never to cause any problems on your skin or in your mouth! 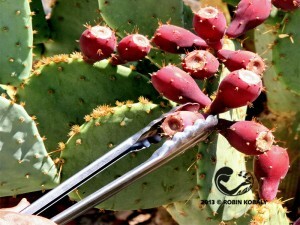 Harvesting cactus fruit with tongs. 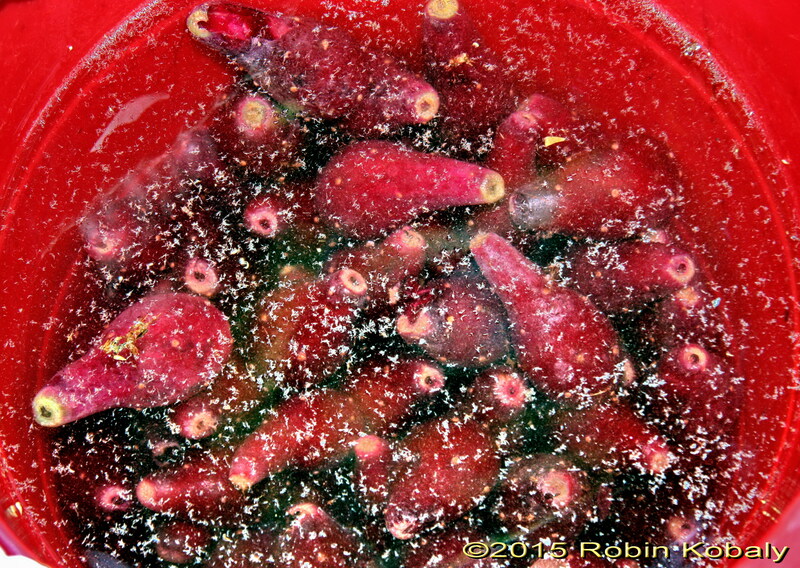 “Cactus apples” on prickly pear cactus usually ripen from June until September or October. 1. Scout out prickly pear cactus around your neighborhood, and watch for ripening of the fruits (“cactus apples”) from June through September or October. 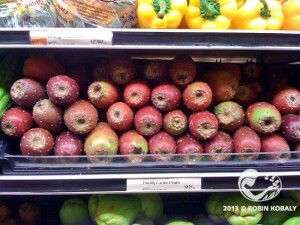 Cactus apples are ripe when they turn deep red, maroon, or in some varieties, bright yellow. Ask permission from neighbors to harvest their fruits if you aren’t the lucky owner of a patch of your own. Spray water with a jet-stream nozzle, creating a whirlpool to tumble cactus fruits against each other to dislodge the tiny spines into the water. 2. Harvest cactus apples using long tongs. Give a twist and pull; ripe fruit comes off easily. Collect in a metal or plastic pail. 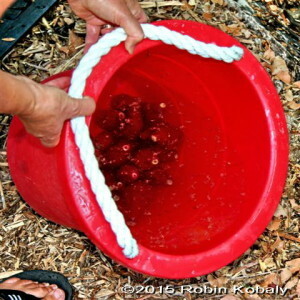 Transfer cactus apples by pouring small batches of several dozen fruits into a small pail. After first wash ~ masses of tiny spines (glochids) will float to the surface. 3. Spray water onto the fruit, using a high-pressure nozzle, until a “whirlpool” forms inside your pail. This tumbles the fruits against each other, and knocks off the spines, which will float up to the surface of the water. Pour off water and floating glochids after each rinse. 4. Pour off the water with the floating spines. Masses of tiny spines will be knocked off the fruits and float to the top. 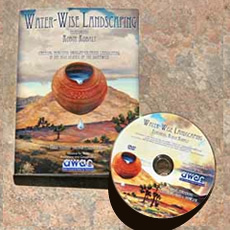 Discard the spine-filled water onto an area where people and pets don’t walk – water your yard plants! Repeat this rinsing/tumbling process three or four times until you no longer see spines floating on the surface after the water stops whirling. Final rinse in a colander/pasta pot removes any lingering spines. 5. Final rinse – For extra assurance to remove any lingering spines, we pour the fruits into a pasta pot or colander for a final rinse. 6. Transfer small batches of cleaned apples into freezer bags, label, and freeze for later use throughout the year. During the freezing process, moisture inside the fruits’ cells expands, bursting cell walls to help release more juice upon thawing (cactus fruits are about 85% water). 7. 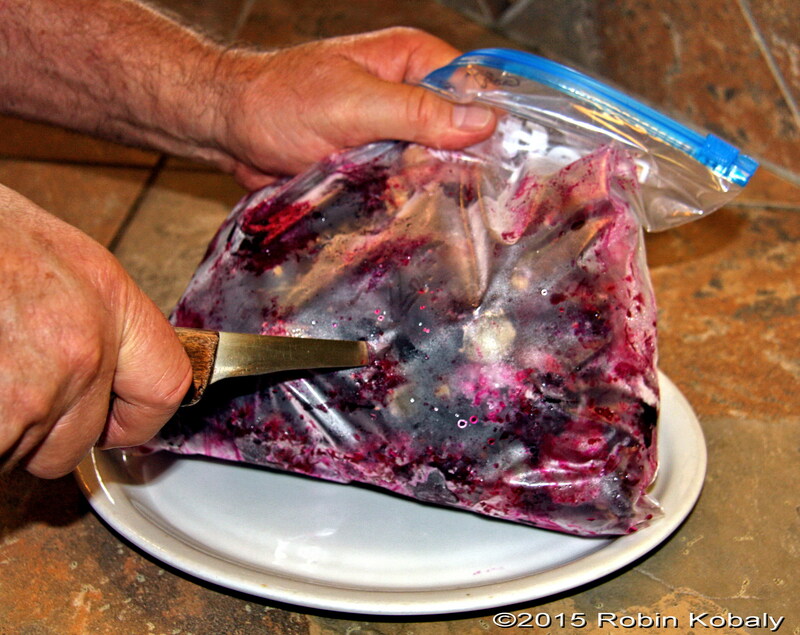 When you are ready to make juice, remove a bag of frozen cactus apples, and poke holes right through the bag into the frozen fruits using an ice pick or narrow-bladed knife. This will pierce the skin of the fruits and release juice as the fruits thaw. 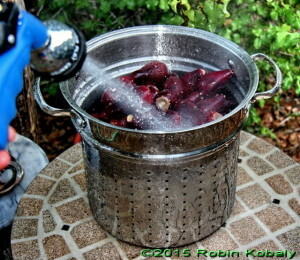 Put the bag of frozen cactus fruits in a colander with a weight on the bag (we use a tea kettle full of water), place the colander over a pot and collect the juice as the fruits thaw. 8. Place the bag with frozen fruits into a colander over a collecting pot, and place a weight on the bag to press out the juice as the fruits thaw. 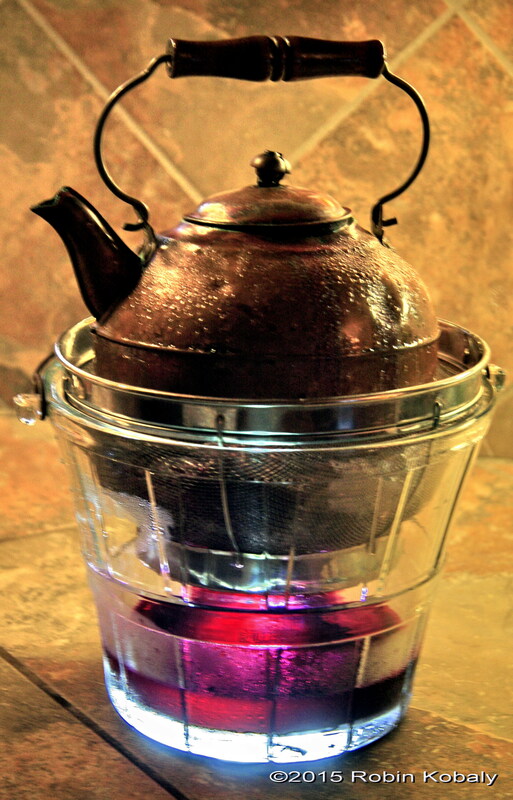 We use a tea pot full of water for weight. Then, walk away and wait until the fruits are completely thawed. The pot will collect the pure cactus juice as the fruits thaw. About 10-12 cactus fruits makes about one cup of pure juice. 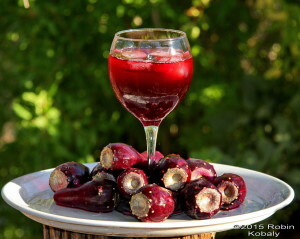 In our batch below, we extracted three cups of juice from 30 prickly pear fruits. 9. For one final assurance that no tiny glochids have made it through your gauntlet of spine abatement, you may filter your final juice through cheese cloth or a coffee filter into a clean pot. Pour your liquid “Ruby Nectar” cactus juice into glasses and enjoy. 10. Pour your pure cactus juice into glasses and enjoy! Some people prefer to add a little agave nectar for a sweeter drink, but we just add some ice during summer months, and serve in wine glasses to showcase the beauty of the beverage. Once we accidentally made cactus “wine” when we left a batch in the refrigerator during an extended expedition out of the country, and my husband relished it. He likened it to red apple jack. For a variation, mix prickly pear juice with equal parts of fresh lemonade, or add a little lime juice, some freshly grated ginger, and a dash of agave nectar. 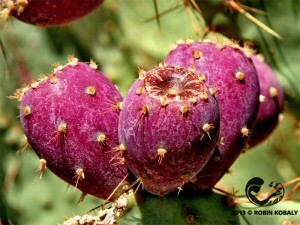 You may also want to indulge in a country-wide passion for prickly pear margaritas using your juice extract. 11. You may recycle the seed-filled pulp of the fruits (for compost, or to feed critters that eat fruit; desert tortoise are especially fond of the fruits), or use the pulp for other recipes. 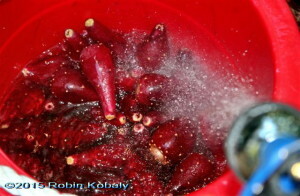 Be aware that the pulp will be filled with hard seeds, and separating the two takes time. This recipe is designed specifically for juice extraction; if you want to use the pulp for food recipes, follow the above tips through freezing. 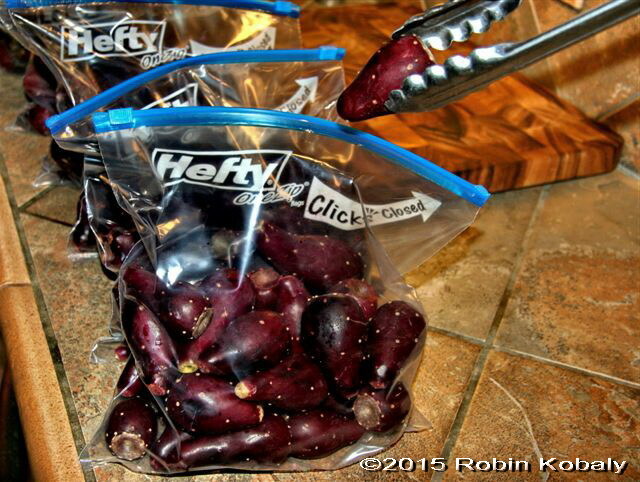 As the prickly pears begin to defrost, their skins will slip off easily. Slit each fruit in half lengthwise with a knife and scoop out the seeds with a spoon. It takes about 8 – 10 prickly pears to get 1 cup of fruit. However you decide to use these bountiful gifts from the desert, enjoy their taste, their color, and their extraordinary health benefits (see my previous post, The Magic of Prickly Pear Cactus). Bon appetite!